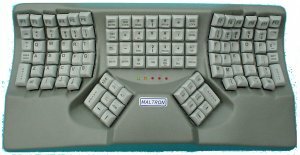 I wouldn't be able to work as a computer programmer without a Maltron ergonomic keyboard. My first was serial number 948. I wore it out writing a book, and have since happily acquired more recent models. As a pianist, I'd have to stop using computers before risking my hands or wrists. Fortunately, the Maltron has made unnecessary to choose between music and work. The Maltron has two advantages over regular keyboards. First, it is curved to fit the actual lengths of your fingers (instead of pretending that your fingers are all equally long, the way flat keyboards do). Secondly, it gives you the option of using a more efficient letter arrangement than the standard "QWERTY" layout. It turns out the the "QWERTY" layout was not designed to help you type quickly, but instead to prevent the machine from jamming. 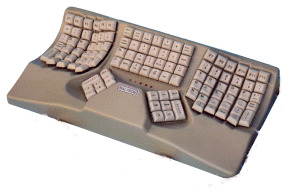 The physical shape of the keyboard, and the letter layout, were designed around the mechanics of the key-lever-hammer system, not around the problem of mapping human finger motions to the English language. But these days, there's no reason for us still to be using that setup. Maltron's shape and new letter arrangement puts common letters in natural places, avoids "single-finger hurdles" (where a single finger has to move between two different keys, for example, typing "lo" on a QWERTY keyboard). Its complete physical redesign allows for innovations like giving "E" to the left thumb, and both SPACE and RETURN to the right thumb. The Maltron allows you to use "QWERTY" if you just want to enjoy the improved shape without relearning how to type. However, I recommend their improved layout (a toggle button switches between the two arrangements). It took me a month or so to learn, and its advantages were immediately obvious by the end of that time. I only type around 60 words a minute on my Maltron (I'm a programmer, so I sit and think most of the time, typing only in spurts). I don't make many typos ("60 words a minute" means "60 words without typos each minute" --- correction time is counted). The most important thing is that it's comfortable. My hands and arms don't get tired or sore even after a full day of work. They also manufacture keyboards for people with limited or no use of their hands. There is a one-handed keyboard (in right and left versions), and a keyboard designed for control with a mouth-stick. I have no experience using these keyboards; I only know that Malton sells them. Maltron has a number of accessories, including carrying cases, switch boxes to use both your normal keyboard and the Maltron, an articulated arm that clamps on to your table, and training courses to help you learn to type on your Maltron. You might also want to check out the Typing Injuries FAQ.